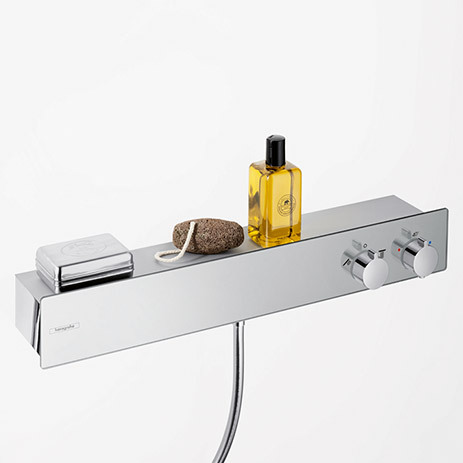 A great deal of hansgrohe's innovative power has been channelled into control units for the shower. Your customers can choose between exposed and concealed thermostatic mixers, which reliably control the water volume and pressure. They can therefore enjoy maximum convenience, and are also protected from any unpleasant shocks of hot or cold water. 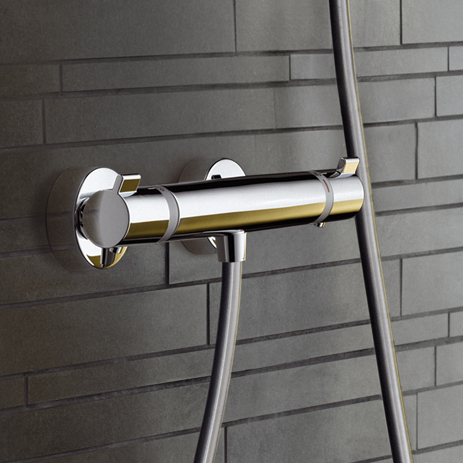 Whether it’s for a new build or a renovation: hansgrohe exposed thermostatic mixers can be installed onto existing connections quickly and easily. They enhance bathrooms both technologically and visually. Here you will find manual exposed thermostatic mixers for showers and bath tubs: ranging from the Ecostat Comfort to the Ecostat Select, through to ShowerTablets with large shelf areas made of safety glass. Shower control systems featuring hansgrohe Select buttons are intuitive to operate and are particularly user-friendly – therefore suitable for people of all ages. hansgrohe thermostatic mixers comply with high standards of safety, offering reliable protection from heat and impact injuries: thanks to the safety lock at 40°C, insulated body with rounded corners and adjustable temperature limitation. Design, comfort and safety are top priority here. With their glass shelves, these multi-functional designer thermostatic mixers offer ample space for shower utensils, putting them within easy reach. Not only is the safety glass, with its rounded corners, a highlight in modern bathrooms, it is also easy to clean. 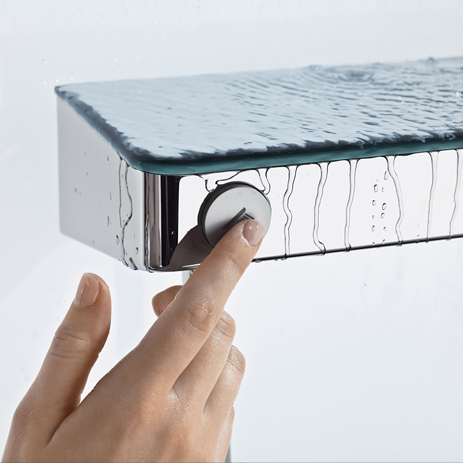 hansgrohe ShowerTablets are also available with a bath spout. 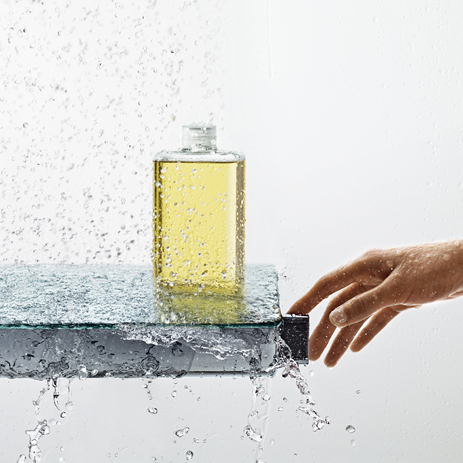 ShowerTablets Select with 300 and 700 mm wide glass shelves. Here you select the desired function intuitively using Select buttons. 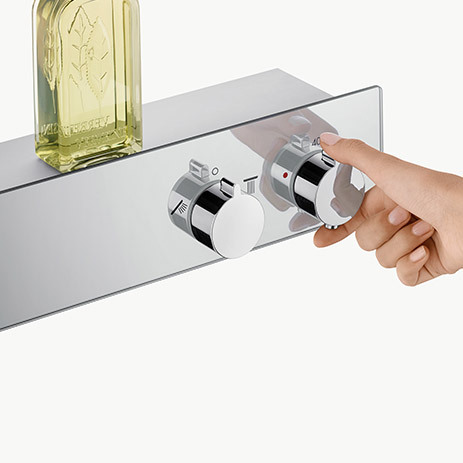 Another advantage: with ShowerTablets Select, multiple functions can be controlled simultaneously. 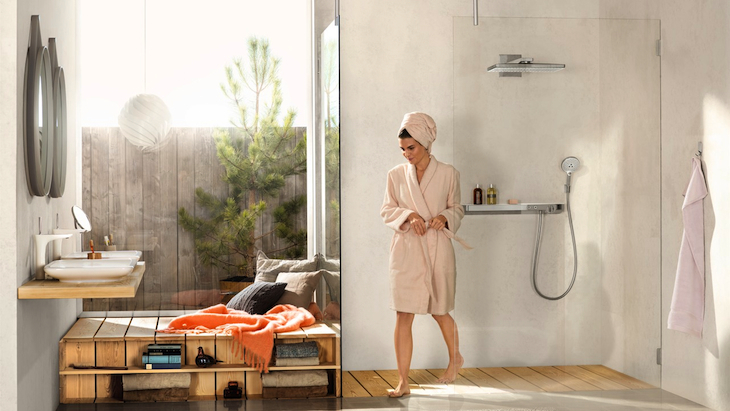 The long, 60 cm ShowerTablet 600 ideally controls large-sized overhead showers such as Raindance E or Rainmaker Select. The 35 cm long ShowerTablet 350 is impressive thanks to its chrome or fresh white/chrome finish and its suitability for combination with lots of hansgrohe showers. Both of these feature control dials for regulating enjoyable showers. Exposed? Concealed? Exposed and concealed? Here you will find some great selling points – and the perfect solution for any bathroom.